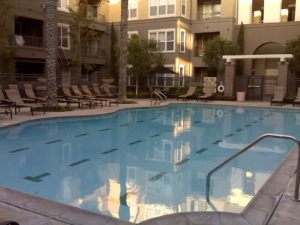 The South Brea Lofts are one of only a few new, urban developments that are 100% made up of Live/Work homes. Meaning that each home has a ground floor that’s dedicated to work only. 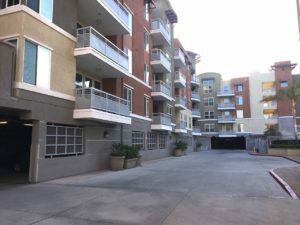 The South Brea Lofts are the outcome of a successful partnership with CWI Development and the Brea Redevelopment Agency. The project demonstrates the City of Brea’s goal of transforming an obsolete and blighted area into a vibrant residential neighborhood for the benefit of present and future generations. The development provides 47 mixed use live/work for-sale units (10 being affordable; including 8 three-bedroom & 2 two-bedroom) with 7,500 square feet of retail space on 2.8 acres of land. Located just one-third of a mile south of Brea’s noteworthy redeveloped downtown and diagonally across the street from Brea’s National Register listed historic 4.5 acre City Hall Park & Plunge, the project encompasses the entire 500 block of South Brea Boulevard that was once a collection of 16 irregularly sized parcels housing many dated commercial structures in a strip retail configuration. From 2001 through 2005, the Brea Redevelopment Agency acquired 16 blighted commercial properties in order to consolidate ownership of the site for future development. The block consisted of four auto repair buildings with the remainder comprised of dilapidated retail and other structures built in the 1950’s which did not meet current health and safety building standards. All acquisitions took place on a willing seller basis, resulting in the majority of businesses/tenants relocating in Brea or nearby. During the same time period, zoning standards for the new Mixed-Use III zone were implemented for new development along South Brea Boulevard. The Agency then issued a Request for Proposals (RFP) in 2005, and selected CWI as the developer based on their creativity at integrating residential, live/work, and commercial into a comprehensive infill plan developed by architect Leland Stearns of Laguna Beach. Their proposal included affordable housing and offered an ecological transportation alternative of an electrical vehicle with each residential unit. While this project is exceptional for its quality design and architecture alone; its creative and unique use of alternative transportation, exemplified by including NEV cars with each market rate and affordable rate purchase and integration of work space, makes it first of its kind. A commitment to improve the quality of life and improve air quality was a critical element of the South Brea Lofts concept. Every new homeowner at this urban core development also becomes the proud owner of an all electric vehicle. These NEVs are public street-approved, have no emissions and legally travel on streets with speed limits of 35 mph or less, but can cross intersections at higher speeds. These vehicles travel at approximately 30 miles on one charge, have a battery life of three to five years, and are equipped with standard auto safety features. The NEVs are transferred with the sale of the town home and are added to the homeowner’s car insurance policy. Each NEV has a separate parking station designed just for it, and the vehicles are managed under a NEV Operating Plan by the homeowners association. One of the key successes of the project is to offer extremely high quality living experience to 10 households qualifying for the affordable units. The project provides over twenty percent of the units at an affordable purchase price, thus exceeding the ten percent inclusionary housing requirement. The affordable units are built to the exact same specification level as the market rate units and include sleek designer finishes, including polished concrete countertops and stainless steel appliances, as well as high-speed Category 5 data lines pre-installed to meet the needs of the modern home/business owners. 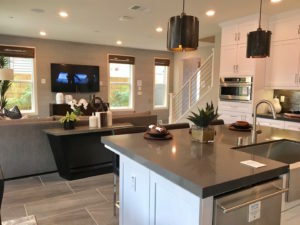 Furthermore, all units, including the affordable units, feature a stacked washer and dryer, European-style cabinets, large windows, central air and heat, and two outdoor decks that create an unbeatable atmosphere. Each unit is coupled with plenty of closet and storage space with large walk-in closets. The amenities found in each home provide for unparalleled comfort and ambiance. Family amenities are a key component of this project. The Brea Community Center and several award-winning “Blue Ribbon” and “Distinguished” public schools (including Laurel Elementary) are within walking distance and provide an excellent education for youth. Numerous recreational and cultural attractions for all ages are within a mile or less. 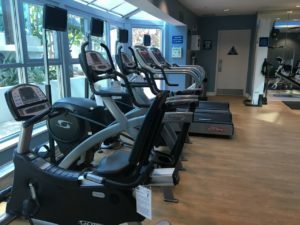 The location also boasts close proximity to California beaches, Disneyland, three area airports within 33 miles, as well as several Orange County Transit bus routes and the Fullerton Amtrak station is less than 5 miles away. There is no shortage of transportation access or local amenities for active families within this new residential development. The site plan adheres to solid urban design principles with strong pedestrian connections to Brea Boulevard and at-the-sidewalk building orientation. Crucial to the success of the project was outstanding architecture. The Spanish Colonial style encompasses the historic elements of South Brea, while providing the same scale and feel as adjacent properties. Elevations feature strong articulation with “360 degree architecture” so all sides of the project offers visual interest. Meticulous attention was given to every detail from the quality of exterior treatments to community-gathering paseos and courtyards. Recreational amenities were also considered carefully and include fountains, benches, seat walls, built-in barbeque, fire pit, dining terrace, pet exercise area, garden art, and two public art pieces. The project includes a mix of two and three bedroom town homes with 37 of the units having dedicated “work” space for either limited retail or office use. 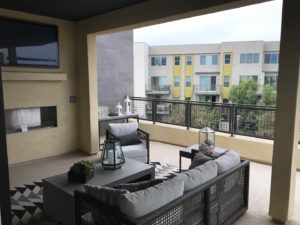 While Brea has a ten percent inclusionary housing requirement, twenty percent of the units are reserved at established affordable levels. The units range in size from 1,137 to 2,239 square feet with a density of 16.7 units per acre. The 600 square foot ground floor “work space” on most of the units can only be accessed by leaving the residential part of the unit resulting in true commercial use rather than a bonus room. South Brea Lofts have earned numerous accolades including the Southern California Association of Governments (SCAG) Achievement Award for Visionary Planning for Sustainability through the Compass Blueprint Program (May 2007), the Orange County Chapter of the American Planning Association (OCAPA) Outstanding Award for a Planning Project (May 2007), and the Award of Merit for a Planning Project from the California Chapter of the American Planning Association (October 2007).